Kennet in the heart of rural Wiltshire , is steeped in prehistory, myth and legend. The area has supported communities from the earliest times and there are few places in Europe to rival the monuments and ceremonial landscapes of this part of Wiltshire. These include the Avebury Stone Circle, West Kennet Long Barrow and Silbury Hill. Avebury Stone Circle lies within a World Heritage Site and is perhaps the most fascinating of all the landscape features. The site has intrigued visitors for hundreds of years and is the largest stone circle in Europe. The Alexander Keiller Museum at Avebury provides excellent interpretation of the landscape and of the history of the first known home of Neolithic man and of the world famous Sarsen Stones used to create the ritual 'henge' monuments and long barrow unique to this part of the country. One of the mysteries of the site is Silbury Hill which dates back to 2700 BC and is the largest man made mound in Europe. The gently rolling landscape of the Salisbury Plain , Marlborough Downs and Vale of Pewsey offer many wonderful experiences. Over half the district has been designated an Area of Outstanding Natural Beauty and provides an ideal location for all types of activity , ranging from hang-gliding to canal boating. The scenery varies from rolling chalk downlands to woodlands and green river valleys. The area provides great walking opportunities from a stroll through the lanes and byways to long walks across the Wiltshire Downs for the more adventurous. Walkers can discover Savernake Forest, once an ancient Royal hunting forest and West Woods, part of the Wansdyke and Ridgeway National Trail which runs along the top of the Marlborough Downs. The magnificent landscape is one of beech woodland and open fields. Kennet is popular for cycling and horse riding with its quiet country lanes and trackways leading to ancient archaeological sites. The Wiltshire Cycleway follows a varied route through the country and passes through some of the most attractive villages in the distract. Contrasts between Kennet's rolling downland, its quiet attractive country lanes, the miles of bridle ways and open areas offer an infinite variety of riding country for the horse riding enthusiast. Kennet boasts five of Wiltshire's famous eight White Horses and these can be seen at Malborough, Alton Barnes, Pewsey and Hackpen Hill and a "Tour of the White Horses" can be obtained at Kennet Tourist Information Centres. 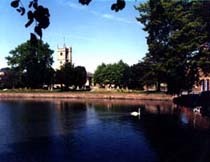 The towns and villages of Kennet are of a varying character. Devizes, the largest of the Kennet towns has a medieval history and this historic market town still has indoor and outdoor weekly markets . Devizes Museum houses the world renowned bronze age collection from the barrows surrounding Stonehenge and traces the history of Wiltshire people. Devizes has an abundance of Georgian houses, particularly in the Market Place. Marlborough's history however goes back much further in time, as legend says Merlin, the magician to King Arthur and the Knights of the Round Table is buried here and gave the town its name 'Merle Barrow' or Merlin's Tomb. Marlborough has reputedly one of the widest high streets in Europe flanked by a splendid number of Tudor and Georgian buildings with Marlborough College situated at one end of the town. It has been a popular stopping point for travellers since the days of the stage coach. Pewsey in the heart of the Vale of Pewsey is a charming village which has many half-timbered houses and thatched cottages. In particular, the Vale is well-loved for its mixture of picturesque villages and magnificent scenery. The Kennet and Avon Canal, one of the country's most beautiful waterways spans the whole of Kennet. The canal designed by John Rennie is famous for The Caen Hill flight of locks at Devizes, the longest in Britain and raises the water level 237 feet over a distance of two and a half miles and is a famous landmark. The Kennet and Avon Canal offers a wide range of holiday entertainment for the visitor. It is perfect for fishing, barge holidays, walking and cycling. There are many canalside pubs giving a welcome respite at the wharfs which also provide excellent angling. The area is rich in industrial heritage related to the canal and local industries such as brewing still survives in Devizes. Beer is still delivered to local hostelries by dray. For those with an interest in the history of the canal, the award winning Canal Interpretation Centre is located on Devizes Wharf and the Crofton Pumping Station south east of Marlborough, houses two restored Cornish Beam Engines, the oldest working steam engines remaining in their original building. Kennet has first class road and rail links with the rest of the country and at its closest point is only a one hour journey from London . Other attractions within easy travelling distance are Bath , Stonehenge, Longleat , Bradford-on-Avon , Lacock and Castle Coombe .